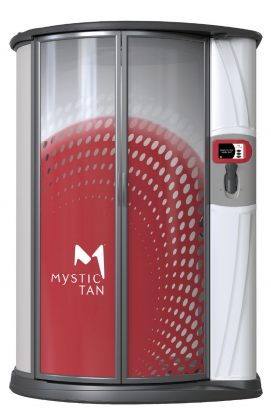 Mystic Tan Kyss, a heated spray tanning system, is designed to consistently deliver a customizable, perfect and natural-looking tan. Every step of your journey — from solution selection to Mystic Myxers™ to the state-of-the-art booth environment — is easy, fun and focused on delivering great color. Mystic Tan spray tan solution transforms skin color to a deep, natural tan. The spray tan solution, in single use cartridges, is formulated with Eco-Cert DHA, Eco-Cert Erythrulose and D-Odor 200™. Eco-Cert, DHA and Erythrulose work in combination to produce a tan that lasts longer, fades more evenly, and provides a natural color for all skin tones. Fragrance-free, bronzer-free, extended spray tan solution allows individuals to personally customize their Mystic Tan with Myxers™. LIMITED TO 2 SPRAY TANS EVERY 7 DAYS.